Everyone in the family called it The Farm with capital letters. 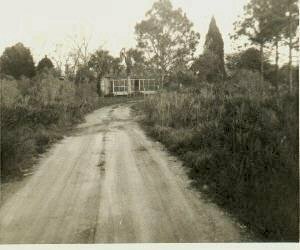 An old Florida Cracker style farmhouse already a century old when my grandparents bought it in the Great Depression of the 1930s, it came with eleven acres, a tidal spring or “bayhead,” and half a dozen huge grafted pecan trees of several varieties. 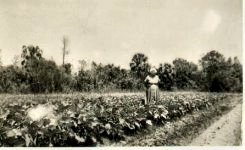 The Farm was situated nearly three miles from the nearest neighbor, on a stretch of the Old Dixie Highway bypassed when the new Highway 19 was built a mile or so to the east. The house faced the Gulf of Mexico with a shaded front porch a hundred yards away from the lime rock road. On the opposite side of the road a broad expanse of tidal flats stretched away to the Gulf for about a mile, dotted by little islets of cabbage palms and cedar trees and palmettos. It was a setting entirely appropriate for a brontosaurus to graze. The only photo of The Farm taken from the road, looking down the driveway. It is winter and the pecan trees are bare. The bootleggers of Prohibition times ran their illicit trade along the Old Dixie Highway. About five miles to the north of The Farm was a little town called Aripeka, named (supposedly) after a semi-legendary Indian chief. Aripeka is “The Town Time Forgot”. A little bit north of Aripeka once stood an elegant resort, raised up in the middle of nowhere, which extended regular hospitality to such luminaries as the great Babe Ruth and Scarface Al Capone. The Farm was the greenest and lushest place I have ever seen. Along with pecan trees, there were several tall cedar trees, cabbage palms, a camphor tree, orange and tangerine trees, fig and pear trees, and a wide variety of semi-tropical shrubs scattered over three acres of thick green lawn. Climbing roses and honeysuckle grew up a big trellis on one side of the porch, and wisteria meandered on another trellis to the north of the house. The house had no electricity or indoor plumbing, but there was an outhouse to the back of the barn, and a big iron hand pump in the backyard. The whole place, except for the long front drive, was surrounded by pine woods. It was, quite literally, paradise. We were spending holidays at the farm from the time we were born. I am about a year old in this photo. My grandparents bought the house as a vacation home, and it was furnished with no longer stylish, too-treasured-to-be-thrown-away antiques and cast off furniture from various family households. The cupboards were stocked with stacks of odd dishes from many times and places, and a special shelf held the row of kerosene lamps always ready for duty. The key was hidden on a rafter on the back porch, and if you used anything in the house, you replaced it and you always left it cleaner than when you arrived. For years, various relatives and friends of the family had enjoyed the use of The Farm, and with all the coming and going, and an occasional hired helper, a large garden was kept year after year in the black muck adjacent to the bay-head in the back. The Gulf high tide pushed through the porous lime-rock against the shallow aquifer, and fresh groundwater rose and watered the garden faithfully twice a day. Grandpa kept his garden like his mind, carefully planned and geometric, growing excruciatingly straight beds of highly prolific things like okra and squash. Rutabagas grew big as pumpkins and collards big as palm fronds. Grandma was able to indulge her obsession for “putting food by” and canned endless bushels of pickles, corn, peas, peas, beans, beets and more. The “bayhead” was a slow freshwater spring which rose and descended with the tides also. When Grandpa waded in to clean it out, intending to make a fish pool and lily pond, he found an old polished chunk of limestone with a name and two dates carved into it. It was obviously a gravestone. The bayhead was thereafter allowed to grow wild. This became for the kids, my brother, cousins and myself, a challenge to our courage, a place of mystery and foreboding known as “The Spring!” The gravestone was placed as a curio on the hearth in front of the fireplace, joining a gigantic turtle shell big enough to cover the entire fireplace opening. 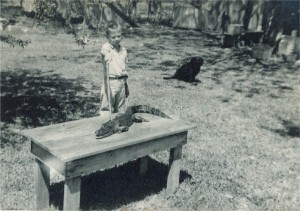 My brother poking our temporary pet alligator, "Pokey" with our dog, Mike, in the background, at The Farm. This was taken on a holiday a few years before we moved there to live with our mother. Sitting on the front porch in the expansive shade of those massive old pecan trees, listening to the rustling of the cabbage palms and the droning of mosquitoes outside the screen, watching the sun descend the last quadrant of the sky to set behind the distant, silhouetted bayheads, is a memory of inexpressible poignancy. Sometimes an entire day would pass without the sound of a single automobile. And if we heard a car in the distance, it was usually someone we knew on their way to The Farm. The Old Dixie between the Farm and Aripeka was empty of any other dwelling. There had been a couple other houses up the road, old farmsteads still in use during Prohibition, but they had long since burned down. 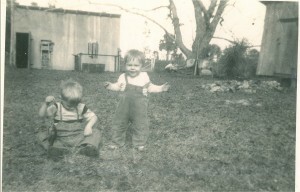 At the time we moved to The Farm, the “parent house” still stood about 300 yards to the south. The Farm had been built by the owner of this larger house as a wedding gift for one of his children. The big house was a rather grand plantation-type affair with a detached kitchen connected by a covered walkway. It was a glorious and mysterious place. We spent many days wandering slowly through it, savoring the ghostly atmosphere, straining to catch the echoes of life and laughter that must have permeated its walls. But we heard only the rustling palms, droning insects, and the calling of an occasional distant bird. The grounds surrounding the house always seemed to be cloaked in a preternatural stillness that added to the thrill of exploration. Later on, when we were no longer living at the Farm, the big house burned to the ground. I felt deeply the loss of its history and meaning and essence. In later years, I heard rumors of the wild boys who bragged about burning that gracious old home. I was sickened and sad. What poverty of soul must exist in those who would derive satisfaction from such wanton destruction? Because of the machinations of my mother, I was forced to sell The Farm in1989. It broke my heart. But, it’s just as well. Nowadays, the sunset view from the porch is blocked by nearly a mile of identical houses built on man-made canals carved out of the prehistoric salt marsh. The honking of horns, squealing of tires, the drone and stench of a sewage treatment plant, have replaced the rustle of cabbage palm, buzz of insects and silence of that clean, balmy air we breathed so long ago. Even the “greenness” of the place has faded. But, for the time we were there, it seemed to have the same effect on me that it had on all the other living things there: growth. The Old Dixie Highway was, for a while, a time warp – frozen by the spirits of bygone days – some gracious and beautiful – some violent and twisted – some narrow, like the road where they lived and moved. The whippoorwill no longer sings at my grandfather’s Farm and the woods where we once hiked and hunted is a golf course now. U.S. Highway19 is the world’s longest parking lot. Take a number and get in line! Grandma in the garden at The Farm. The house was rather primitive. We had only the fireplace for heat, and an old gas range in the kitchen that required bottled gas on a regular basis, but after all of the events of the past years, getting settled down in the old house was truly like coming home. It was familiar. Every object settled in its precisely correct place according to the designs of my grandfather. A barn full of interesting items waited to be explored: an old “woody” station wagon, a big diesel engine. The tool shed held sets of tools for every design and purpose. The storage shed contained an old Victrola, boxes of magazines from the 20’s and 30’s, trunks full of old clothes, and jar after jar of old coins among the treasures. There were also boxes of books. In one, I found a book with a rather off-putting title, seemingly about politics, in which – up until the assassination of John F. Kennedy – I had no interest. So, there I was, poking around in the shed with the disturbing events of that November heavy on my mind and heart and there it was: “The Story of A Secret State” by Jan Karski. I picked it out of the box and opened it to read a page or two. For some reason, I continued to read with inexplicable fascination. I realized I was holding my breath. I read on. “On the night of September 1, around 5:00 am., while the soldiers of our Mounted Artillery Division tranquilly slept, the Luftwaffe roared through the short distance to Oswiecim undetected and, perched above our camp, proceeded to rain ablating shower of incendiaries on the entire region. At the same hour, hundreds of the powerful and modern German tanks crossed the frontier and hurled a tremendous barrage of shells into the flaming ruins. My heart was pounding painfully in my chest, but there was no way I was going to put this book down. I’m sure I must have had dinner or something, but since I always had the habit (deplored by my grandmother) of taking my books to the table and reading while I ate, it’s a certainty that I wouldn’t remember it. I was no longer at the farm because I was over there: in Europe, in Germany, and most of all, in Poland. By the time I had finished Karski’s book, I was certain that the only person I could ever marry would be a Pole. The heroism and fortitude and sheer guts of those in the Polish resistance were extraordinary. My mind was dazzled. I admired courage, intelligence and creativity more than anything else. I believe this inspired me to hold these qualities as conscious ideals. A child’s goals and perspectives in life are formed at crucial stages of imprinting. And, perhaps this was one of those times when my mind was open and waiting for seeds to be planted, only to bloom many, many years later. Perhaps this could have been the awakening of a certain awareness sleeping fitfully since the time of my birth. One thing is certain: the thread of events in Nazi Germany, both tragedy and hope, wove themselves through my life like a ribbon of darkness and light. The nightmares began again. I dreamed of endless vistas of dead bodies in cratered landscapes. Planes flying ceaselessly overhead in smoking red skies. Soldiers, terror and tears. Rivers of tears, where serpents writhed, flowed across the land. I had lost my balance internally and at the same time I had found the first firm footing of my life. Now nothing interested me at all except to try to understand how so great and terrible an event as the Holocaust could happen on the face of the Earth if there was a God in heaven. Indeed, it diverted my attention from the present evil that led to John Kennedy’s murder, but somehow, I felt that if I could understand the Holocaust, any and all other evil would be comprehensible.